RELIEF was Danny McGrain’s initial emotion at signing with Celtic – as it brought an end to mundane Maths lessons! Along with Kenny Dalglish, the Hoops great had initially been part-time at the club. Part of that arrangement meant regular trips to college, with McGrain having designs on becoming a mechanical engineer. However, Higher Maths never added up. 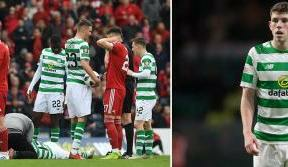 Both youngsters were far more in favour of a football education at Celtic. Eventually, they summoned up the courage to knock on Jock Stein’s door, asking to pen professional terms. It was brave step but it bore fruit. Stein agreed to their demands and McGrain and Dalglish would form part of the intake which benefited from working on a daily basis with the Lisbon Lions. It was the finest schooling an aspiring footballer could receive. Along with the likes of George Connelly, Davie Hay, Paul Wilson, Vic Davidson and Lou Macari, this group of young players would become collectively known as the ‘Quality Street Gang’. One by one, they would all graduate into the top-team to replace the Lions and help Celtic maintain their domestic dominance well into the 1970s. For his part, McGrain would go on to enjoy an extraordinary career at Celtic, He served the club with great distinction for the best part of two decades, making 663 appearances, many of them as captain, and winning a plethora of silverware. 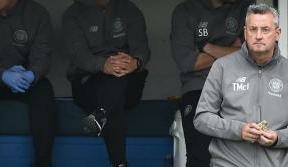 To this day, he remains at Celtic as a coach for the Development Squad, passing on his knowledge to the next generation of players. Here is his story of becoming a Bhoy. Before you joined the club’s youth system, where were you playing football? I played for Queen’s Park Strollers, which would be under-18s, along with Scottish schools. I played for the school in the morning and Queen’s Park in the afternoon, which I never found tiring at that age, although it shouldn’t have been tiring around 16 or 17. Apparently, Tommy Reilly, Mr Stein’s friend, came to watch Scottish schools with Sean Fallon, when we got hammered 4-1 by England schoolboys. I had just turned 17 at this time. Sean Fallon came up to my house in Drumchapel and wanted me to sign. Up to then, people were saying to me that I could be a professional footballer, but I never thought I would be a player. So when Sean Fallon came up to sign me on a part-time basis, I thought I needed to stay on at school. But he said that they would send me to college as I wanted to be a mechanical engineer – that was my hope. But I had to get a Higher in Maths. I got an O-level Maths but couldn’t understand Higher Maths. The club sent me to Reid Kerr College for a year and I still couldn’t understand it. At the same time, Kenny was training to be an apprentice joiner. It never worked out for me and I don’t think Kenny was enjoying being an apprentice joiner so when the year was out, me and Kenny decided to go and ask Mr Stein to go full-time. Was it difficult juggling football and college when you were part-time? I played Junior that year as the club wanted you to go out and get experience, and I learned to look after myself. Kenny was lucky and went to Cumbernauld, a brand new club with a new park. I went to Maryhill Juniors, an old club with an old park, and got kicked from pillar post. I never really enjoyed it. We never won one game in six months – it was that bad I got voted Player of the Year! Kenny was at Cumbernauld, scoring goals every week and was just a natural goalscorer. It wasn’t until years down the road that I realised what I had learned there. I learned how to look after myself and improve my awareness of the game. That was why Mr Stein wanted us to go there. Wherever you play, you always have to learn something, be it a good game, a bad game or an indifferent game, and take something from it. I was taking things in but wasn’t aware that I was doing it. How did it feel to sign for the club? I think it was relief as I didn’t have to do any more Maths! I didn’t have to try and get into the mechanical engineering. 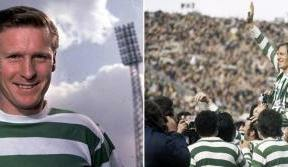 With the club lifting the European Cup days after you joined, and regularly competing for top honours, it must have been an exciting time to be a young player at Celtic? Of course and we reached the European Cup final in 1970 as well. I made my debut that year and Kenny and I went to the final, not as boot boys but for experience. How many chances do people get to go to a European Cup final with a team? Again that was the type of manager Mr Stein was. It was great to see the preparation but then we lost to Feyenoord, which was awful for us as the first-team were our pals now. Dutch football had been in its infancy but unknown to us it was growing. They came and took over, and played us off the park that night. What were those first weeks like? We did go full-time and we signed the week after Lisbon and the following week we were in training with theses guys. To go from being at college at 17 or 18, from Drumchapel, and go all the way to Celtic Park and train altogether as one group with the Lions was amazing. I just remember the first pre-season running around the track and running and running…with these older guys and names that I heard of like Big Billy and Bobby. We thought we could outrun them. We did some hard work and Big Billy was just passing me as if I was stuck in mud and I was giving it everything. That was my first introduction. I went from there and three years later I made my debut. Were you ever intimidated when you walked into a dressing room occupied by such household names? No, because when we first arrived we trained together. We were one squad. It wasn’t a first-team squad and reserve squad, so we got to know each other. We would play games together. You would be playing alongside and against the likes of wee Jimmy, Bobby, Big Billy and Bertie. You can’t become friends as we were too young but you just to know them, so when you made your first-team debut it was still a daunting task but you weren’t as nervous. They were still the Lisbon Lions, you still had a great respect for them, and I have great deal to thank them for. For me, Kenny, Victor and Paul to be able to play with these guys was like being at Yale University for football. We had to take everything from it, and I thing we did that. What it was like being part of such a talented group of young players at the club? I think Jock Stein and Sean Fallon gave everyone the confidence that they could make it. The whole Lisbon team were ahead of us and it might be another five years before I could even try and get into the first-team. Originally, I was a midfielder who would run about everywhere, and Mr Stein and Sean Fallon put players in various positions in the reserve team – I think I played every position apart from centre forward and centre-half. After two or three years, Mr Stein thought I would be a full-back. However, I never thought I could be a full-back as I always thought that full-backs had to be hard tacklers and good defenders but once I played there I was comfortable. At that time, I was playing with Kenny, Vic Davidson, Lou Macari and Paul Wilson – all guys who made it into the first-team. And because we all made it into the first-team, it made it a bit easier to come into. Because we had come through together, you knew what kind of passes they wanted and what they liked. Was it a good grounding to play in that reserve set-up before you went into the first-team? Charlie Gallagher played alongside us a lot and he was a very good player. You learned from him and there would be others who would play when they were coming back from injury. Davie Cattanach was there most of the time as well and he was a rough and ready defender who was very enthusiastic. It was good for us to see someone who was perhaps out the picture but still had great enthusiasm for the club and still worked hard. He also takes a bit of credit for our knowledge of the game. After signing for the club back in 1967, could you have ever imagined having such an illustrious career and still being at the club nearly 45 years later? I was quite happy getting the first day over with and the games out of the way! Nobody ever thinks that’s going to happen. But it’s been enjoyable. I left in ’87 and never came back until ’97. I still kept in touch and still watched the games – but I don’t count those 10 years, they never existed! So it’s been a long time but I have enjoyed every day of it.